Every now and then, someone in your newsfeed will put up a plea or threat for friends to stop sending game requests or invites. I got news for you: the person you’re aiming it to is too busy playing games to notice. In fact, putting a stop to this is in your hands and it doesn’t involve unfriending people (unless you’re looking for an excuse to, then by all means go ahead). First, access your Games page under Apps. 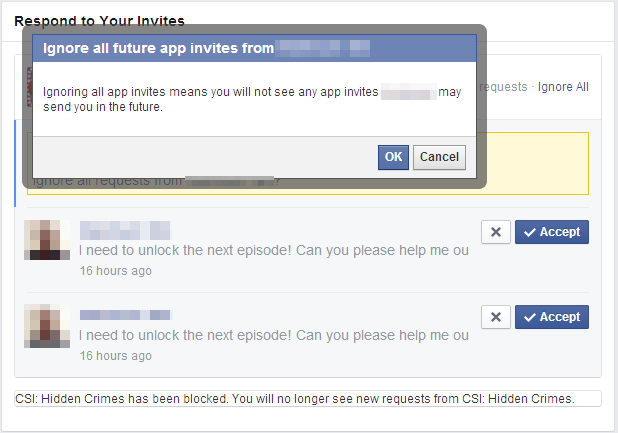 Invites – games you’re not playing or not linked to your FB account, and probably the bane of your existence right now. 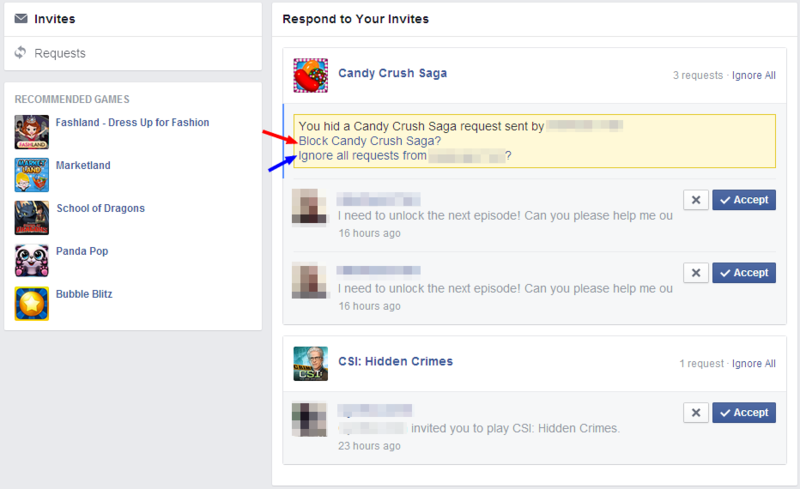 Requests – games that you do play on FB or linked via mobile. These are lives and stuff that you want, so we’ll skip this bit. The serial gamer who sent you invites for many, many games and apps. 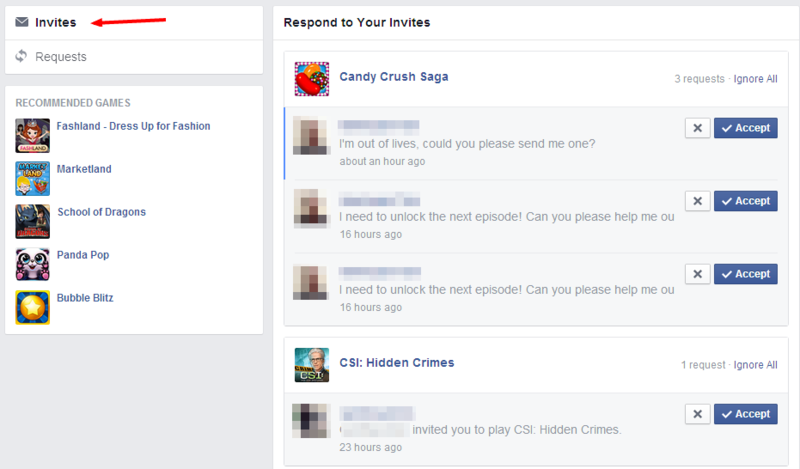 If your Game Activity page is currently full of invites, you should be able to tell at a glance who the repeat offenders are. If you can’t remember, leave the game invites to pile up for a week. If it is a popular game that I know I won’t be playing, choose ‘Block [game]’. Nobody will be able to send you any sort of request from that game. If it’s a serial gamer who blindly send invites to everybody, choose the second option: Ignore all requests from [friend]. No matter what that friend plays, they will never be able to send you anything from any app. This is the dialogue box you get when you click ‘ Ignore all requests from [friend]’. 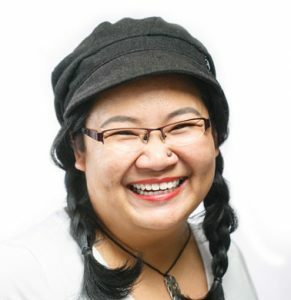 Click OK and you’ll never get invited by this person to play a game or try any app ever again. I hit ‘Ignore All’ for CSI. This is the notification box you get (bottom). I only had one invite after 24 hours of begging my friends to send me invites, so I have to conclude that they are either busy playing or already blocked. If you have a full page of invites, similar options will likely be available so pick the one most relevant to you. This is what it looks like when you choose ‘Block [game]’. 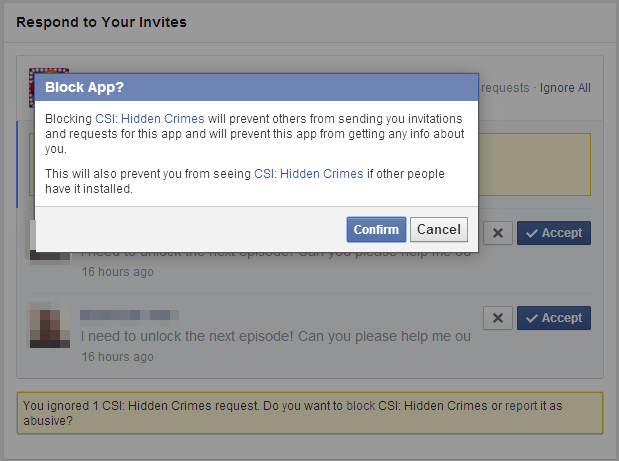 These steps also work if you’ve stopped playing a game but you’re still getting requests. Go to the Request tab (See Step 3) and block the game from there. Occasional maintenance is necessary, especially when a new game or app hits the market. I’ve implemented this for my own profile a long time ago and game invites are extremely rare these days because all the usual suspects have been blocked.